Now, I won’t pretend it’s as easy as opening a box and a couple pouches or ordering a McMeal, once you get in the habit of conceptualizing your meals the way a chef would, your food will look and taste better. In culinary school, novice chefs are constantly challenged to come up with delicious dishes as part of their curriculum. This exercise is known as the “mystery basket”. It’s just as intimidating as it sounds: you are given a certain amount of time (usually between one and two hours) to create a dish using your given protein and the ingredients in a stocked pantry. After you have presented your dish to the chef, he critiques the plate presentation, cooking techniques, ingredients utilized, creativity, and most importantly, the taste. When you cook dinner for your loved ones, they may not criticize you work as severely as a chef might, but their comments and facial expressions can be just as telling. And what is cooking dinner on a weeknight if not taking stock of your pantry and throwing something together? Unless you’ve got Martha Stewart on Skype for your menu planning sessions, it’s mystery basket time. Say you’ve got chicken breasts and Swiss chard. You could…grill the chicken and sauté the chard with tomatoes; make a chicken soup with chard, beans, and pasta; roast the chicken and dress steamed chard with sesame oil and chili flakes; fry the chicken and stew the chard with bacon; make a fragrant chicken/chard curry and serve it with basmati rice…so many possibilities! Yesterday I was dealing with this very mystery basket equation. My critics, although fairly easy to please, are quick to tell me if a dish is just “alright” or if it’s “the best thing I’ve ever eaten, can I please have a 3rd helping?” With this in mind, I decided to stuff the chicken with a mixture of cream cheese, garlic, bread crumbs, and the leaves of the chard, then sauté the roulades until golden brown and juicy. I then devised a complementary sauce utilizing the remaining chard stems, balsamic vinegar, and blackberry preserves. After the main item and its condiment were developed, I rounded out the meal with a bulgur wheat pilaf and green salad. 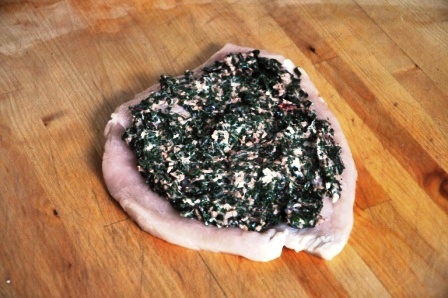 Complementary flavors: chard is a mild green with an earthy taste that pairs well with the straightforward chicken. The sauce’s subtle sweetness suits the greens, and has an acidic edge to cut through the richness of the cheese. Varying textures: the juicy chicken, smooth cheese and chard stuffing, moist sauce, chewy whole grains, and crunchy, fresh salad are all unique and add interest to the dish. Sauce is a must for any restaurant dish, but most are usually made with butter, egg yolks, oils, or roux (a flour paste for thickening). 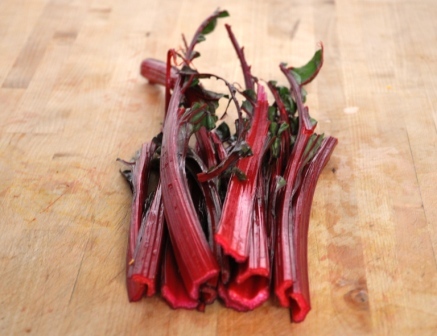 This one is made with the Swiss chard stems, which offer thickening power and valuable nutrients without additional fat. Visual appeal: who doesn’t like stuffed things?! Not to mention all the different colors, this dish does not disappoint the eyes. You can stuff the roulades and make the sauce a day in advance if you are serving this dish to company. Neufchatel or reduced fat cream cheese can be substituted for full fat, but don’t use nonfat cream cheese, that stuff tastes like chalk and chemicals. Now go open that big white mystery box in your kitchen and let the ingredients be your inspiration. 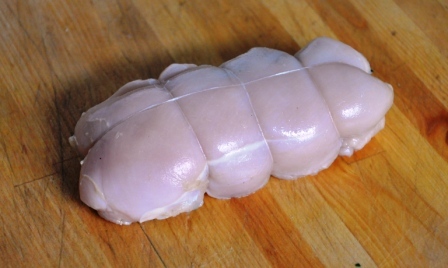 Butterfly the chicken breasts horizontally, so they open like a book. One at a time, place them between two sheets of plastic wrap and pound gently with a meat mallet or rolling pin until the chicken is ¼ inch thick. Set the chicken aside. Fill a pot with ½ inch of water and place a steamer basket inside, then place the pot over high heat while you prepare the chard. Wash the Swiss chard thoroughly to remove any grit. Tear the leaves from the stems and chop the stems finely. When the water is steaming, put the leaves in the pot and cook for 2 minutes, until tender. Scoop the leaves from the steamer and leave to cool on a plate. Add the chopped stems to the steamer and cook for 5-7 minutes, until tender. Scoop the stems from the steamer and put in the bowl of your food processor or blender. Squeeze all the water from the cooled chard leaves, chop finely, and place in a bowl. Add the garlic, cream cheese, bread crumbs, egg, salt, pepper, and nutmeg. Stir the mixture until everything is evenly combined then set aside. Pat the chicken breasts dry with paper towels and lay them cut side facing up. Divide the filling mixture evenly between each breast and spread it out with your fingers leaving a ¼ inch border all the way around. Tie the roulades with kitchen twine or secure with toothpicks. Season the outside of each roulade evenly with salt and pepper. Heat a large skillet over medium heat, add the vegetable oil, and carefully add the roulades. Cook for 15-20 minutes, turning the roulades often so all the sides are evenly browned and the chicken is cooked through. If they are browning too quickly, turn the heat down and cover with a lid. When cooked, cover with aluminum and rest for 10 minutes while you prepare the sauce. 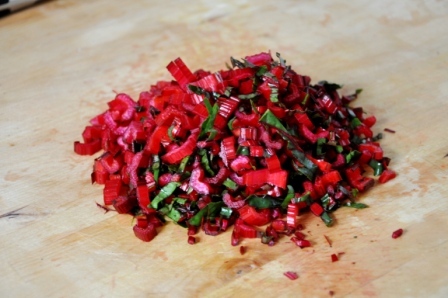 Add the sauce ingredients to the steamed chard stems in the food processor or blender. 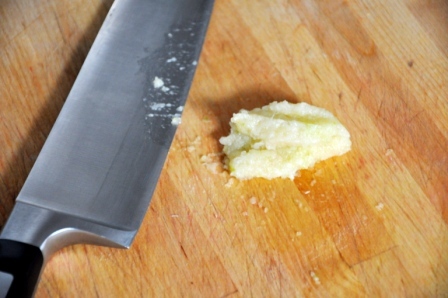 Puree until smooth, and then taste for seasoning. You may need to add additional vinegar, salt, or pepper depending on your taste. 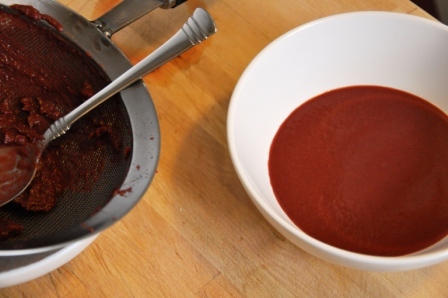 You can keep the sauce as it is, or strain it through a fine mesh strainer to remove any fibers from the stems. Pour the sauce into the skillet you used to cook the chicken and heat until warmed through. 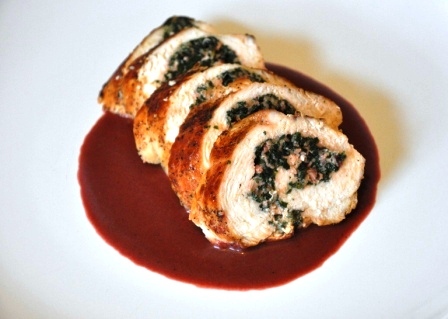 Slice the chicken breasts crosswise and serve immediately with the sauce.